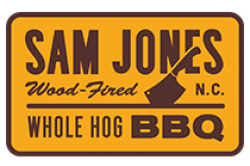 Sam Jones is the third generation to cook traditional whole hog barbecue. Sam’s family opened Skylight Inn in 1947 in Ayden, NC with a very humble beginning. Since then they have always stayed true to what has made them what they are, a standard bearer for wood cooked eastern NC style barbecue. Skylight Inn and Sam Jones BBQ, as well as Sam, have been mentioned among the greats when it comes to legendary barbecue joints and pitmasters in many publications, and as well on several TV shows. 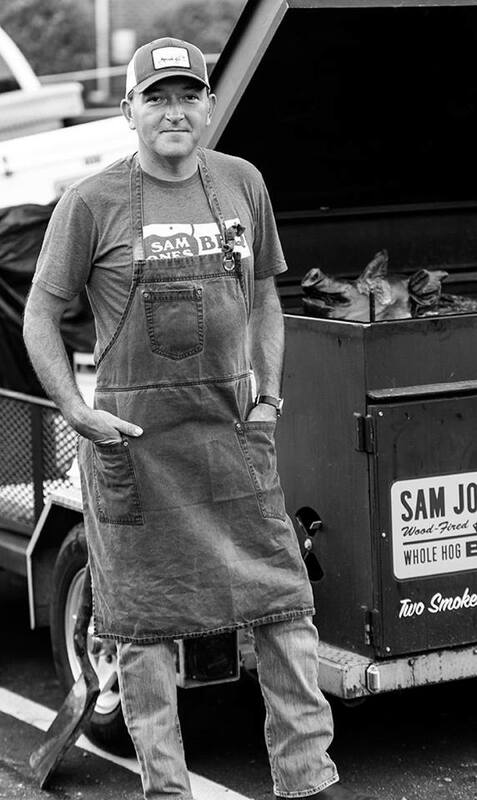 In 2012 Sam was named as one of the “Top Ten Pitmasters in South” by Southern Living. The greatest honor was bestowed upon Skylight Inn in 2003 when the Jones family were honored with a JHAmes Beard award for “Americas Classic”. In the fall of 2015 Sam Jones BBQ opened in Winterville, NC. It’s a new restaurant but with all the indicators of traditional BBQ. From the smell of the smokehouse to the freshness of the food, you’ll know this is the future of eastern NC BBQ. Sam is passionate about barbecue, and what it means in his family. More importantly, Sam is known for being an honest hard working guy who loves people, loves his hometown, and loves what he does.